For prospective Dr.Web users — Dr.Web — innovative anti-virus technologies. Comprehensive protection from Internet threats. I'm using a demo version. What can I do if I have any questions about the program? You can find user manual files on the page http://download.drweb.com/doc. They contain a sufficient level of detail on how to use Dr.Web. We first recommend that you study the user manual. It is quite possible that you'll find the answer to your question there. Also, users who are just getting familiar with our program can look for the answer to their question in the section Frequently Asked Questions. Can I try Dr.Web before I buy it and how do I do it? Of course, it is a good idea to test how the program operates on your computer before buying it. Doctor Web offers its prospective customers an opportunity to evaluate a Dr.Web anti-virus for 30 days, once in 4 months. Availability of all features in the demo mode is a huge advantage of Dr.Web: it detects malware and provides curing just as well as commercial Dr.Web products, time of use is the only limitation. 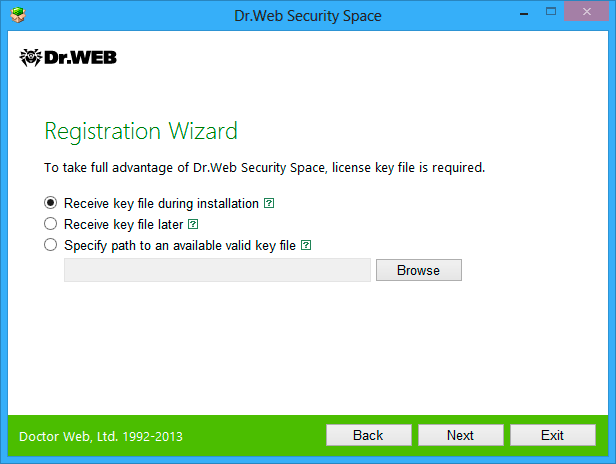 If you are going to to protect your Windows or Linux PC or Mac with Dr.Web, download the distribution, install and register the software (Internet connection is required). In the License Key file step, select Receive Key file during installation and a key file with validity of 30 days will be automatically downloaded and installed on your computer. To evaluate corporate Dr.Web solutions, use the web-form to request a demo key. Can I update the databases in the trial mode? Yes, you can. A demo version has no functional limitations. You can update the database as scheduled, or manually. Do I need to remove the trial version from my computer before I install the licensed version? Removing the program from your computer is not necessary. To turn a trial copy of Dr.Web into a licensed version, you need to purchase a license and register it. Right click on the Dr.Web icon in the system tray and select Register in the context menu. 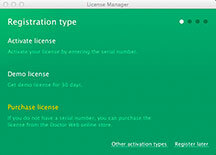 During registration you will need to choose the option Obtain a license key file with serial number. Once you have entered your serial number, a key file will be downloaded to your computer automatically. An Internet connection is required for registration. Does a 30-day Dr.Web protect my computer properly? A Dr.Web anti-virus with a 30-day demo key functionally is no different from a similar product with a license key (except for its time of use). Thus, the installed Dr.Web anti-virus demo provides protection from all types of malicious software. How can I extend my trial license and get a discount? The discount does not apply to 30-day trials. 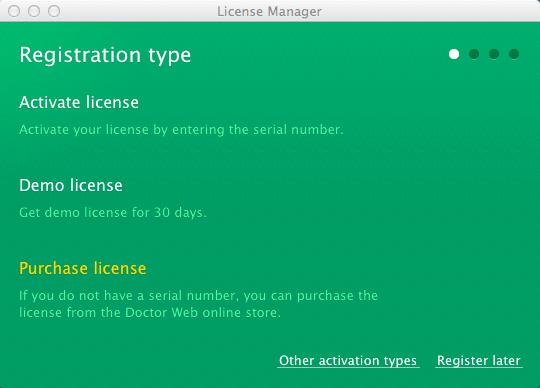 To continue using Dr.Web after the 30-day trial period, users must purchase a standard new license (not a renewal license). How do I get a demo key, if an Internet connection is not available? If you represent an organization, submit a demo key request through the form on our web-site. 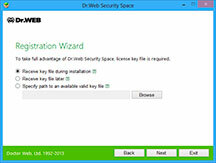 If you need keys for Dr.Web for Windows and Dr.Web Security Space, then you need to request a demo for Dr.Web Enterprise Suite. Select the agent.key from the acquired set of keys to activate Dr.Web for Windows and Dr.Web Security Space. If you are a home user, you must connect to the Internet and obbtain a key from our web-site. Note: You can't port a demo key to another PC, the anti-virus won't work with the key file on another computer. I receive newsletters informing me that the demo period expires, even though I bought a commercial license (renewal license) and registered it. What shall I do? Right-click on the Dr.Web icon in the notification area. In the context menu, select Tools–> License Manager. In the License Manager you need to remove the demo license (key file drwdemo.key) and reboot the computer. I'm using a demo Dr.Web anti-virus. Since yesterday an anti-virus usage period expiry message appears whenever I reboot the system. What's happened? This message means that the thirty day trial period is over. You need to either remove the anti-virus, or purchase a licensed version of Dr.Web. I'm using a demo version of an anti-virus from another company. Can I change it for Dr.Web at a discount under the promotional offer "Switch to the green"? No. In order to migrate to Dr.Web anti-virus at a discount provided under this programme, you need a commercial license for a different anti-virus. Find out more about the "Switch to the green!" programme here. All products developed by Doctor Web come with comprehensive user manuals. To download a manual for the anti-virus installed on your PC, look for the product’s description in the Download section of www.drweb.com. Open a corresponding page and download the manual from the Documentation section. If you can't find an answer to your question in the documentation, please go to the Frequently asked questions section or contact the Technical Support service. The program informs me that the demo expires, even though I bought a commercial license (license renewal) and registered it. What shall I do? What is the difference between the demo version of Dr.Web and the licensed version? The two versions differ only by their time of use — a demo version works only for 30 days. There are no other differences between the demo and licensed versions of Dr.Web, because we believe that any limitation in the operation of the anti-virus will prevent a new user from making their own opinion about the product. What's the difference between a demo version and a beta version? A demo version is a full version of the anti-virus that will be operational for 30 days. There are no other restrictions on its use. A beta version is a preliminary released, not yet officially available for sale version of the program. Beta versions are created to allow users (beta testers) to undertake extensive testing of the product which will enable developers to fix bugs before the program is released officially. Using a beta version always incurs a risk since errors in the program can make its operation unstable or cause system errors.